The year 2006 was memorable to Tendai because it was the 1200th year since Tendai Buddhism was authorized as an officially recognized Buddhist School by the Japanese Imperial court on January 26th, 806 C.E.. Dengyō Daishi (Saichō), the founder of Japanese Tendai Buddhism, believed in the teaching of Ekayana (One Vehicle); everyone is equal and anyone can attain spiritual awakening. He was authorized to educate and train monks to spread this teachings based on One Vehicle. Dengyō Daishi’s wish was for official recognition of Tendai, and along with that, each school of Buddhism in Japan at that time co-exists in order to relieve the suffering of all sentient beings. Because of this, when the imperial court authorized Tendai, the court also established the number of monks for each school of Buddhism. Since then, Tendai has transmitted the Light of the Dharma, the teaching of Dengyō Daishi, for 1200 years, producing many schools of Buddhism. Mt. Hiei is known as the Mother Mountain of Japanese Buddhism, and has been an important source of Japanese culture. Altogether 26 denominations and sects of Japanese Buddhism went up Mt. Hiei, the Tendai spiritual headquarters, for the Commemorative Service for the 1200-Year Anniversary of the Establishment of Tendai Buddhism in Japan, held in October of 2005. They conducted the services at the Konpon Chūdō, the main ritual hall of Enryakuji, on Mt. Hiei on that occasion. The first Religious Summit Meeting on Mt. Hiei - The Interreligious Gathering of Prayer for World Peace - was held by inviting representatives of religious organizations from around the world in 1987. Since that time, we have held the event yearly, and will host the 20th Anniversary of the Prayer for Peace in August of 2007. We firmly believe that these activities beyond the denominations and sects of Japanese Buddhism, as well as the world’s great religious traditions are in accord with our founder, Dengyō Daishi’s spirit. Saichō’s life and teachings are the root of the 1200-year history of Tendai Buddhism in Japan. It is our great desire that Tendai Buddhism will be understood by people around the world through this booklet. “What is the treasure of a nation? It is the spirit seeking for the Buddha Path.” This is a well-known statement made 1,200 years ago by Dengyō-Daishi Saichō (766 or 767-822), founder of the Japanese Tendai Denomination. The words mean that only those who bring into full play their abilities in accordance with their positions and surroundings, refrain from selfishly seeking personal gains, and ceaselessly work for the welfare of others, are truly assets to a nation. Sachō also said that we should shake ourselves free from our own worldly desires. His objective was to have us, both Buddhist priests and lay people, exercise our faculties to be this treasure. Saichō was born in the year Tenpyō-jingo 2 (766 A.D.) in Ōmi, present-day Ōhtsu City, Shiga Prefecture. He was called Hirono during his youth. According to the family register, the date of his birth was in 766, but another version said in the year Jingo-keiun 1 (767). His father was called Mitsu no Obito Momoe. His ancestors were said to be the descendants of the emperors of the post-Han Dynasty (25-220) in China. At the age of 13, he went to the Kokubunji Temple in Ōmi to become a disciple of Gyōhyō. He was allowed to attend the ceremony of entrance to the Buddhist priesthood and became a novice at 14. This was the first step in the process of government certification. Then he started to study Buddhism in earnest. On this occasion, he received the Buddhist name Saichō. In the fourth month (according to lunar calendar) of Enryaku 4 (785), the then 20-year-old Saichō received the Small Vehicle precepts at Tōdaiji Temple in Nara to qualify as an official priest. In a sense he had embarked on the path of a promising young monk, a member of the elite in the capital city of Nara. Only three months after receiving the precepts, however, he retreated to Mt. Hiei. Mt. Hiei, located near Saichō’s homeland, was known as a sacred mountain from olden times. There are still many opinions about his motives for retreating to Mt. Hiei. One of the most credible of these is that he fully understood the impermanence of worldly things in Nara and he retreated to the mountain in order to engage in intense self-reflection. He believed that his understanding of Buddhism was still shallow, so he was determined to pursue further studies on Mt. Hiei, which was close to his hometown and had been known as the dwelling place of Kami (Japanese spirits and gods) and Buddhas since ancient times. Shortly after moving to the mountain, Saichō took five vows, which are found in his Ganmon (Vows: Saichō’s Prayer), to show his determination to perfect his study and practice. So long as I have not attained the stage where my eyes and heart are pure and close to Buddha, I will not venture out into the world. So long as I have not realized the absolute, I will not acquire any other teachings except for Buddha’s. So long as I have not kept the precepts purely, I will not participate in any ceremonies for lay donors. So long as I have not attained the Buddha’s wisdom free from any attachment, I will not participate in worldly affairs. May any merit from my practice in the present be given not to me, but to all sentient beings so that they may attain supreme enlightenment. We can see his very serious will through these vows. Saichō moved to Mt. Hiei and devoted himself to the study of Buddhism. Gradually, many monks gathered around him. 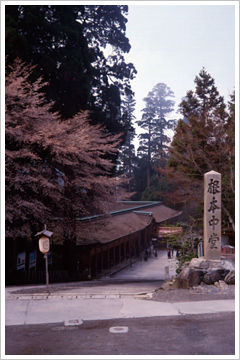 In the year Enryaku 7 (788), Saichō decided to establish the Hieizanji Temple on Mt. Hiei as a new fundamental practice hall based upon Tendai teachings. Saichō carved an image of Yakushi Nyorai (Medicine Buddha), and enshrined it in the hall. On this occasion, he lit a lamp, dedicated it to Yakushi, and prayed that this light would burn eternally. This Dharma Lamp has been burning over 1,200 years in the Konpon Chūdō Hall. 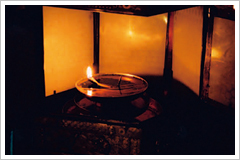 It is called the Fumetsu-no-Hōtō which means the inextinguishable Dharma Lamp. At first this hall was called Ichijō-shikanin, and later became Konpon Chūdō. Then gradually halls were built. In the year Enryaku 16 (797), Saichō, then 31, was appointed as a one of ten Naigubu, or position attendants to the Emperor at the practice hall in the Court. He, thereby, became an influential monk and well recognized in society. Gradually the foundations for practice were established and the community on Mt.Hiei grew, Saichō planned to acquire the Issaikyō (collected complete works of the Buddhist canon). Although the colleagues and disciples on Mt. Hiei worked hard together on this project, there were limited by manpower and cost because every character needed to be hand-copied. Therefore, Saichō turned to the temples in Nara for help. In compliance with his request, one monk (Monjaku), who resided at the Daianji Temple, kindly offered his aid to Saichō. Also Dōchū (735?~800? ), a leading monk in Tōgoku (present-day Kantō; mid-eastern area of Japan), took Saichō’s will into consideration sent great volumes of Buddhist scriptures. Subsequently Dōchū’s religious order stayed in close contact with Saichō. As the Buddhist canon was prepared, Saichō planned to hold the Hokke Jukkō ceremony, a lecture series on the Lotus Sūtra. On the twenty-fourth day of the eleventh month, this ceremony was held with a deep sense of gratitude on the anniversary of Tiantai Dashi Zhiyi’s (Tendai Daishi Chigi in Japanese, 538~597) death, who was the founder of Chinese Tendai. Since then this ceremony has been carried out annually and is called the Shimotsukie ceremony. The Hokke Jukkō ceremony has been held annually on Mt. Hiei since Enryaku 17 (798). In Enryaku 20 (801), ten high priests from Nara were invited to the ceremony. Thus, the scale of this ceremony became large and Saichō’s profound scholarship became well known throughout society. Around this time, members of the Court grew interested in Saichō and the Tendai teachings. Emperor Kanmu asked Saichō his opinion on how to propagate the teachings of Tendai. Saichō offered a petition to the throne for a trip abroad to Tang China in order to study the orthodox Tendai teachings directly under the Chinese Tendai priests and to fill in the gaps of the Tendai manuscripts held in Japan. This request was accepted at once. 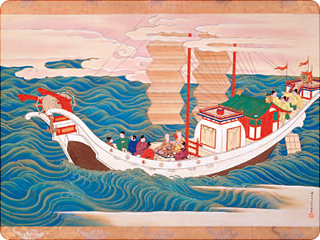 In the fourth month of Enryaku 22 (803), Saichō boarded the embassy ship to Tang China and sailed from the present-day Ōsaka Bay, however, the ship was damaged by a rainstorm. His study abroad was suspended and he was obliged to stay in Kyūshū. It is said that while in Kyūshū, he carved an image of the thousand-armed Kannon at Sōmonji Temple and also he prayed for a safe voyage to China at Kawara Jingū and Usa Hachiman. In the seventh month of Enryaku 23 (804), Saichō set sail again for China. Again a rainstorm arose and he encountered troubles but his ship safely arrived near present-day Ningpo in Zhejiang Province. His prayer was answered. After his arrival in China, on the fifteenth day of the ninth month in 804, he left for Mt. Tiantai, where the headquarters of the Chinese Tendai Denomination had been located from the time of Zhiyi. Nowadays one can still see the Guoqingsi (Kokuseiji) Temple and historic sites there. Daosui (Dōzui) who resided at the Xiuchansi (Shuzenji) Temple and Xingman (Gyōman) who resided at the Fulongsi (Butsurōji) Temple, were both the disciples of the sixth head priest of Tiantai, Jingqi Dashi Zhanran (Keikei Daishi Tannen, 711~782), and were the leaders on Mt. Tiantai when Saichō visited. Saichō met Tao-sui on his way to Mt. Tiantai. Daosui at once kindly prepared for the hand copying of the Tendai manuscripts for Saichō. Saichō finally arrived on Mt. Tiantai in the beginning of the tenth month. He received a transmission in the Tendai teachings from Xingman (Gyōman) and in the Niutou (Gozu) school of Chan (Zen) from Shunian (Shukunen), who resided at the Chanlinsi (Zenrinji) Temple, there. In the third month of 805, Saichō studied Mahāyāna (Great Vehicle) precepts under Daosui. This was a very important experience for him because in the latter part of his life he earnestly sought to establish a Mahāyāna Precepts Ordination Platform in Japan. 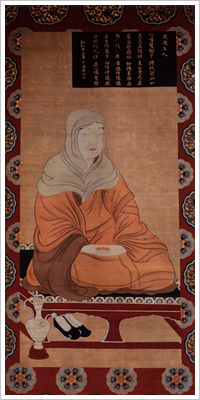 Then he visited the Longxingsi (Ryūkōji) Temle and was initiated into Esoteric Buddhism by Shun-hsiao (Jungyō). Then he set out on his journey to Japan. Although he studied in China for only nine months, Saichō tried his utmost to learn as much as possible. In the fifth month in 805, Saichō embarked on a homebound embassy ship to Japan with various Buddhist manuscripts and implements obtained in China. As soon as he returned to Japan, Saichō went up to the capital Kyōto and reported his homecoming to the Imperial Court. Emperor Kanmu earnestly hoped that the Tendai teachings that Saichō brought back from China would prevail in the country. So, the Emperor issued orders that paper of high quality, of the type usually only for the use of the Imperial Court, be prepared and that hand-copies of seven Tendai scriptures for each of the seven big temples in Nara be made. At that time paper were very valuable. Thus Tendai teachings gradually prevailed with the help of the Emperor and Court. Also Saichō was expected to teach Esoteric Buddhism. On the seventh day of the ninth month in 805, Kanjō Initiation was held for the first time in Japan. On the seventeenth day of the same month Saichō also performed a prayer from Esoteric Buddhism at the Imperial Court. Such ceremonies were held for Emperor Kanmu, who had become seriously ill and needed authoritative and effective prayer for his early recovery. Emperor Kanmu put full confidence in Saichō. In the first month of 806, Saichō applied to Kanmu for permission to grant yearly ordinands (public-official priests); his application was granted within the month. On this occasion, Saichō argued that only one or two denominations could not cover the vast teachings of Buddhism and so he proposed that in addition to Kegon, Ritsu, Sanron, and Hossō denominations, the yearly Tendai ordinands be newly allowed as part of the twelve total novices granted each year by the state. Since then those yearly ordinands were granted annually. Thus, the Tendai Denomination was formally recognized by the State. This was the foundation of the Japanese Tendai Denomination. As for Esoteric Buddhism in Japan, Kūkai (774-835), the founder of the Shingon Denomination who had accompanied Saichō to China, concentrated his studies on the Esoteric teachings. He returned to Japan a year after Saichō. Saichō repeatedly borrowed many manuscripts from Kūkai in an attempt to make up for the insufficiencies in the Tendai Esoteric teachings. Also he received Esoteric initiation from Kūkai in Kōnin 3 (812). But Saichō’s most beloved and promising disciple Taihan (788-? ), who Saichō asked Kūkai to train in Esoteric Buddhism, did not return to Mt. Hiei under Saichō. In addition, Saichō and Kūkai’s views on Esoteric Buddhism diverged, so they gradually became estranged from each other. Kūkai thought Esoteric Buddhism was the most important of the teachings. Saichō emphasized that both Tendai teachings and Esoteric teachings could lead to Buddhahood, so that, therefore, they were equal teachings. After Saichō, Tendai Esoteric teachings were enriched and perfected by Saichō’s disciples, such as Ennin (794-864), Enchin (814-891), Annen (841-889?) over about a hundred years. In the spring of the year Kōnin 5 (814), Saichō revisited Kyūshū to pay a visit of thanks to the buddhas and dieties. He had previously prayed at several temples and shrines to insure a safe voyage to China during his stay in Kyūshū. When he had set sail, the embassy ships had been damaged by a rainstorm and he had been forced to suspend his study abroad. While in Kyūshū in 814, he first carved an image of the thousand-armed Kannon and made two copies of the Daihannya-kyō (Great-Wisdom Sūtra). When Saichō lectured on the Lotus Sūtra before the kami Usa-Hachiman of the Jingūji Temple, it is said that the great kami was so delighted that it appeared and presented Saichō with a puple robe with its own hands as an expression of gratitude. After that Saichō also gave a lecture on the Lotus Sūtra before the kami Kawara at the Jingūji Temple in return for the kami’s favor. They say purple clouds of good fortune floated from the peak of Mt. Kawara up to the sky. In order to pray for national peace and to propagate Mahāyāna Buddhism, Saichō established six pagodas not only in Kyūshū, but also in various other places in Japan. Each pagoda contained one-thousand copies of the Lotus Sūtra. In the spring of the year Konin 8 (817) Saichō left for Kantō (the mid-eastern area of Japan). He aimed to establish two of the six pagodas in the Kantō area so as to propagate Mahāyāna Buddhism with the Lotus Sūtra as the central teaching. On his way to Kantō he built two lodging houses named Kōsai-in and Kōjō-in. These were special residences in two locations on a major route that was difficult to pass. He built them in an attempt to provide convenience for travelers. This is a noteworthy work in Saichō’s social welfare activities. Later Saichō entered the Kantō region. He conferred the bodhisattva precepts and performed Esoteric initiations at Daijiji Temple in Tochigi Prefecture and Midonoji Temple in Gunma Prefecture. It was said that many people gathered to celebrate the foundation of the pagodas at these two temples. Since around that time a controversy called San-Itsu Gon-Jitsu Ronsō (the debate over whether the One-vehicle or Three-vehicles, were the provisional or the real teaching) started between Saichō and Tokuitsu (?-842?) who belonged to the Hossō Denomination. There had been six Buddhist schools in Nara called the Nanto-Rokushū before Saichō founded the Tendai Denomination. The Hossō and Sanron schools were the most influential denominations among them. These two denominations relied on commentaries on the sūtras. Saichō emphasized that Tendai, called a kyō-shū or denomination based on the sūtras, needed to be propagated against denominations based only on commentaries. In response, the Nanto denominations began to criticize the Tendai teachings that Saichō tried to propagate. A heated controversy arose between Saichō and Tokuitsu. They argued differing views on Buddhism and exchanged controversial treatises each other. Although these arguments did not result in a decisive conclusion, Saichō’s arguments and thought, presented through this controversy, came to have a great influence on Japanese Buddhism. After Ganjin (Jianzhen) came to Japan from China in the year Tenpyō-shōhō 4 (753), three official precept platforms were established respectively in Nara, Tochigi, and Fukuoka. People who wanted to obtain the official position of monk had to receive the precepts at one of those three precept platforms. But, Saichō believed that the precepts conferred at the three platforms were Small Vehicle precepts and that to become a genuine Mahāyāna bodhisattva monk who sought the true path, one must receive only the Mahāyāna precepts. Therefore, Saichō planned to found a new, state-recognized platform for the Mahāyāna precepts on Mt. Hiei. Accordingly, he abandoned the Small Vehicle precepts which had been the basic requirement for becoming an official monk. Although he did not lose his position by this renunciation, the move was indeed quite decisive. Saichō organized the system of study and practice on Mt. Hiei and launched an independent movement for the founding of a Mahāyāna precepts platform. He submitted many proposals to the Imperial Court. In these proposals Saichō insisted, “there are Mahāyāna (Great Vehicle) and Small Vehicle monks in Buddhism. But in Japan we have only Small Vehicle monks and do not have Mahāyāna monks. So we, the Tendai Denomination, wish to train Mahāyāna monks.” The Court, however, did not accept his proposals due to strong objections from the conventional Buddhist schools in Nara. The Sōgō (the Office of Monastic Affairs) also lodged a counterargument against Saichō. Although Saichō wrote the Kenkairon in response to show clearly that his assertion was correct, his arguments were not accepted by the Court.